There has been some time since my last post. I said I was taking a break from my previous job and learning new stuff. Well, one thing I’ve been learning is Chef. I’m very excited because Opscode, the company behind Chef (which is Open Source), has given me a generous discount so I can attend to the conference. I’d like to thank Opscode for the discount, but also for thinking that my humble contributions to the project worth enough. I think the community they have create around Chef is really great. You just have to ask something at the maillist or the IRC channel to see how nice is the people there. There is always someone ready to help you out. Well, from 15 to 17 of May I will be attending the #ChefConf. If you like to attend, tell me and I’ll give you a community discount for the registration. They gave me a few. After 6 years living in Seville and working at Emergya I found there was the end of a cycle so I have to move forward and start new things. Happy haking from my new life at Canarias! My good friend José Félix Ontañón has released the first stable version, website and ppa of his last project, udev-discover. 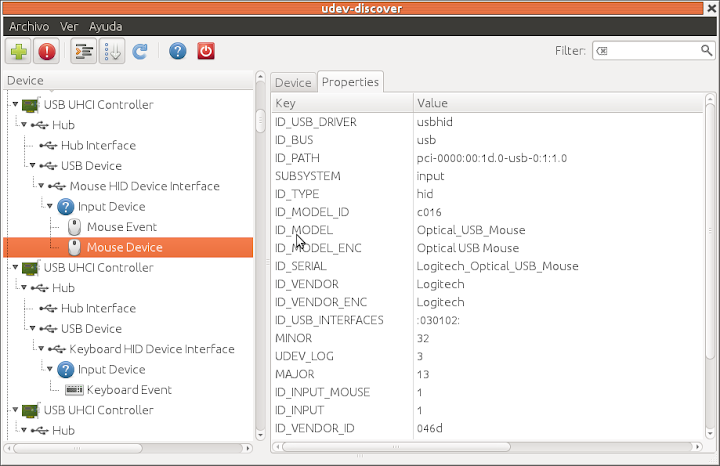 udev-discover is a very useful tool for all developers who use to deal with hardware. It use GUdev to get the info and has a very nice features to make the hardware integration debugging easier. It was inspired on the old GNOME Device Manager (which was based on the HAL Device Manager), which wasn’t no longer active after the migration from HAL to GUdev, but then he added some very nice features such a search box, debug output console, the possibility of select the subsystems you want to be shown, follow the signals and new devices pluged in realtime and much more. I forgot to link the code which is (by now) hosted at Github until Félix move the project to GNOME infrastructures. I also forgot to mention that I got it working fine at Ubuntu Oneiric, but it has a little bug about one path which is already reported. Félix told me that a minor version with this and other minor bugs fixed will be released very soon along with packages for Oneiric at the ppa. 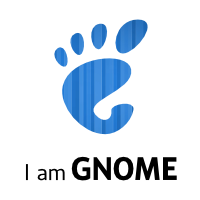 I’m GNOME 3 as well! Big and greats days for many of us. GNOME 3 is finnaly out! I’m proud of being part of a great community of people who is able to accomplish such a big amount of work and have this great libre desktop ready to go. I’m just a user, fan, I used to do some translations and I do collaborate now with some bugs and patches to a few projects, nothing like a lot of good friends here who, for me, are real heros. It’s amazing the work some people is able to do. Hat off to them! As a proof of that work you can see the weekly commit digest and see how more than 200 hackers make more than 2000 commits (sometimes even more than 3000) per week to get ready this awesome project. I know there are some fears from people using GNOME 2, but a lot of those fears are just myths, so people like me that work at downstream distributions for specific set of users and big deployment can be relaxed. I just want to save some words of this humble post to some people I’ve been working with sometimes. People I know that have been working really, really hard to make this new GNOME 3 world more accessible to everyone, the GNOME a11y Team. They had too much things against them, but they are really hard workers. Posted on April 7, 2011 April 7, 2011 Categories a11y, distros, gnomeTags a11y, gnome, gnome 33 Comments on I’m GNOME 3 as well! Sorry to the non-spanish speakers this is an anounce for the people who feel more confortable speaking Spanish than English and all the people who may know people that feel like that. Para quienes no lo sepan, Orca es el proyecto libre principal en torno a las tecnologías de accesibilidad en el escritorio. Últimamente se está haciendo un gran esfuerzo por mejorar este aspecto y se quiere obtener todo el feedback posible. Como la comunidad hispana es una de las más implicadas en este y otros aspectos del escritorio se acaba de abrir una lista en español para que puedan participar más activamente dando experiencias de usuario. A continuación les copio el anuncio oficial para que tengan la información y la difundan en los círculos que crean conveniente. 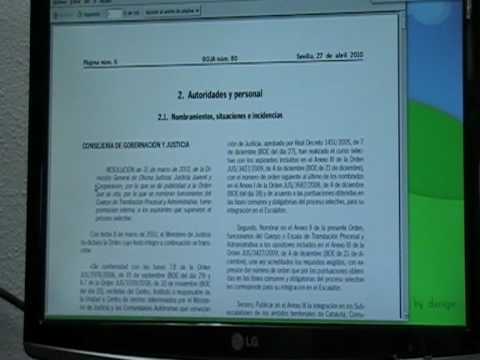 Estamos encantados de anunciar la creación de la lista orca-es-list, una lista de correo oficial de GNOME para los usuarios hispanohablantes del revisor de pantalla Orca. Facilitar la participación a usuarios no-angloparlantes con la comunidad de Orca ha sido durante mucho tiempo uno de los objetivos, no conseguidos hasta la fecha, del equipo de desarrollo de Orca. Ahora, gracias al apoyo del Consorcio Fernando de los Ríos, la participación continuada de los desarrolladores de Emergya, y la voluntad de usuarios hispanohablantes de Orca de contribuir con su tiempo y conocimiento, el equipo de desarrollo de Orca está en posición de mantener dicha lista de correo. Estamos muy agradecidos a todos los que han hecho posible esta nueva lista de correo, incluyendo a GNOME por facilitar la infraestructura de hosting. ¡Esperamos verte por la orca-es-list! NOTA: El anuncio original de esta lista, aparte de en la lista en inglés de Orca ha sido en este post de uno Alejandro Leiva, uno de los mantenedores del proyecto. We keep working on a11y improvements for the GNOME desktop. We’re focused on some Orca and OCRFeeder bugs the Consorcio Fernando de los Ríos has ask us to fix. But when we started with the Orca’s ones we realized that Orca needed a better configuration system and Joanmarie (Orca’s maintainer) invited us to solve this before going on fixing the other bugs. At this point we had to decide what configuration system we should migrate Orca to. At the first shot, GSettings seemed to be the better choice, but after a second thought it didn’t seem so obvious. The settings manager itself is almost ready and now it is working properly with the old Python based config files. The next step is to get the GConf backend ready to go. Later, when the GSettings support in Python is ready, we’ll create that backend based on the GConf one (it should be easy). For the GConf backend we are focusing first on defining the schema, because there are a lot of different keys and values to care about and they need to be checked and confirmed. My friend Javi is working on that and he has asked for help to check for missing keys, values or deprecated ones. Any help here will be very useful. Once he has the GConf schema, he’ll be able to create the backend which will get and set the different keys and values into GConf system. I know that all this settings manager sounds a bit overcomplicated but the implementation won’t be and we need it, at least for the transition. Hopefully we’ll skip this manager and we’ll let just the GSettings connection at the next cycle. The discussions were very interesting and explained better than me the needs that made us to take this approach so, I recommend reading them if you’re interesting on this topic. My friend Félix is still improving his Wiican project, a software for configuring and management of your wiimote under GNU/Linux. Now he is adding D-Bus so third apps can manage the wiimote as they want through it dbus interface. It seems pretty cool to me, but he explain it better at his blog. I hope you enjoy this project and (as me) the progress he is doing and explaining. Meanwhile we are working on a “import from the scanner” feature for OCRFeeder, which is quite functional and is also waiting to be finished the patch. But also we are working on Orca. We have a few Orca’s bugs we are looking at, but we don’t have time for all of them, so we need to select the ones our client believe are more important. NOTE: This post is not mine, the post have been originally writen by my friend and colleague Félix Ontañón (aka fontanon) which is far more complete than the one I could write, so he let me translate and publish his original one here. As part of the Guadalinfo Accessible project Juanje Ojeda , Lorenzo Gil (from Yaco) and myself, were invited by Stormy Peters and Paul Cutler to the Gnome 3.0 Marketing Hackfest Zaragoza , an event organized by the Gnome Foundation, ASOLIF, the CESLA and the Governments of Aragon and Zaragoza, where was the place where the plans for the Gnome 3.0 launch: communication, promotional videos, etc. were going to be cooked. Our objective was clear: to open ways of collaboration with the Gnome Foundation and present our intentions to develop projects, in terms of accessibility for the Gnome desktop. The Consorcio Fernando de los Rios is currently bidding in Andalusia: Improvements, bugfixes and to imitate the JAWS’s behaviors on Orca; image acquisition, improved recognition and export formats on OCRFeeder and reading the text with Orca from PDFs on Evince . In the event was also present Dani Baeyens from Warp, who will also work in Gnome accessibility projects under the contract of Fernando de los Rios Consortium, improving Caribou (Gok replacement) and functional integrity of predictive text, Presage . When we arrived at the event, the table of participants were discussing concrete actions on the initiative of Ambassadors Gnome, but we soon could start to present the developments that we, Yaco and Emergya, were involved. In a round shift Lorenzo, Juanje and I told the massive use of Gnome is promoted from the local government in various ICT initiatives: Guadalinex , Education , Guadalinfo and the the Network of Libraries , which justifies a special effort to promote and address the problems of assistive technologies and public services are fully accessible to all citizens. Attendees were surprised by the examples of use of assistive technology devices with the Gnome accesibility assistances and asked us to hang material on the Gnome 3.0 website: photos or videos of real people using Gnome and devices in the Guadalinfo centers. We had a first task. At lunch time, we dived into the issue with Vincent Untz and Licio Fonseca who advised us on ways of collaborating with the community to gain acceptance of our developments. In the afternoon Paul and Stormy sat down with us to see what we could do –the companies- for Gnome and viceversa. We insisted on that the local government has a real interest in supporting accessibility projects, for its projects and that these developments, are given back to the community. If we get visibility and acknowledgement for these initiatives in the community, we are sure more projects will come. We trust in Gnome as a Government-friendly community and that’s how they want to be received aswell. Paul asked us to work directly with the developers of the applications through the traditional communication ways that are usually used in the community: mailing list, irc, etc..
And that way we started, Lorenzo made public its intentions to improve Evince and Alejandro Leiva, from Emergya, ours . The reception is being good, and the community is reporting feedback. This starts up! UPDATED (10/05/18): Fixed the Lorenzo’s name at the first paragraph and the urls, that were all wrong. But two weeks ago some friends and me were at the GNOME Marketing Hackfest at Zaragoza to talk with some people from the GNOME Foundation about accessibility and GNOME. The reason is something I’ve already told in others posts, that a few Spanish companies are going to collaborate between us and with GNOME a11y projects to bring as improvements as we can to our loved desktop. My friend and colleague Félix Ontañón (aka fontanon), who is leading the part of the project that is being doing by my company has written a very good summary (the original in Spanish) of the meeting. From my company we try to contribute to FLOSS community but the most of the times we don’t have the rights to publish the code we do, so it is like a dream to have a client who specifically ask us to work directly with upstream and to work as the community does. We hope to have this kind of opportunity more often. We really do! If you have any advise about, just tell me, please. We are very open to collaborations and to any opportunity of write free code and knowledge.